I have another polish to share with you today from the Cult Nails Dance All Night collection. This is one of the glitters, and I'm going to call it and say this my favorite glitter from this collection! 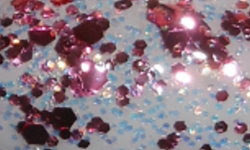 This glitter has a lot of elements that really make it complex and special. Center of Attention is a mix of rose pink glitters and a golden iridescent glitter in a clear base. Color: This is gorgeous! I love the pink glitter, and the micro iridescent glitter was a beautiful surprise to me. I absolutely love glitter bombs that include hidden shimmer or micro glitter. I find these really add dimension to a polish and make them extra special. Formula: This formula was a little on the thick side, but not unmanageable in the least. This applied evenly and easily to the nail. Price: I bought this and the rest of this collection during the pre-sale run, but you can purchase it now individually for $12 on the Cult Nails website. Overall: Gorgeous, stunning, awesome. You need this. I'm calling this a must have! Sooo pretty! This is such a Disney princess manicure :).